On news of the shocking events surrounding Malaysia Airlines flight MH17, I felt extremely saddened and shocked at how feeble life can be. I am sure that you felt the same way: the heart beats fastens, the mind staggers and time suddenly stops. However, it hits you in a whole different way when you know somebody on that very flight. Despite holding some troubled experiences of my time at school, I clearly remember the positive moments, too. As a shy ten-year-old in fifth grade at a brand new school, times were tough. I wasn’t a high achieving academic student nor was I an aspiring athlete with tons of potential. No, I was in a special class for students falling behind in their work and consequently, had difficulty making friends. I clearly remember being introduced to the nuns of the Sacred Heart; a group of inspiring women who brought love and compassion into the lives of every student. Luckily, I was chosen to be a helper to these beautiful ladies on a weekly basis. This is where I clearly remember coming across Sister Philomene Tiernan, otherwise known as Sister Phil. Even though Sister Phil didn’t play as big of a part in the junior school as some of the other nuns, I do remember her welcoming smile and cheerful attitude that always left us leaving with massive grins from ear to ear. I can honestly say that this experience was a turning point in my life. Sister Philomene was returning from a spiritual retreat in the French town of Joigny, when the incident happened. From what I heard, she was finally given the opportunity to see Saint Madeleine Sophie Barat (founder of the society of the Sacred Heart) in her resting place at St Francis Xavier Church. Now, she’s even closer to her. 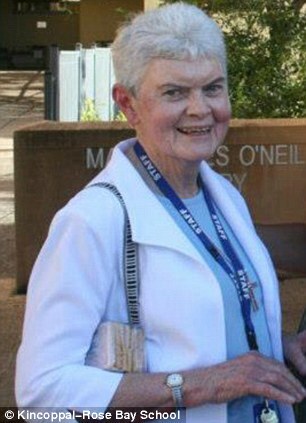 Last night, when I saw Sister Phil’s face smiling back to me on the news, I knew something was wrong. Everything just stopped. No, this cannot happen to her, I thought. There must have been a mistake! But, there wasn’t. This inspirational woman was one of 28 Australians tragically killed when her plane was shot out of the sky in Ukraine. Now, I know there is a widespread negative stereotypes around nuns (or ‘penguins’, as some like to say), but Sister Phil subverted such typecasts. Every Sacred Heart nun I met did, in fact. I still cannot fathom why such a beautiful woman could leave this world so quickly and violently. It sickens me to the stomach. Now, as horrible as a situation like this is, knowing somebody involved makes it even harder. Sister Phil brought joy and happiness to everybody she met. I used to have faith in the belief that life achievements and success was based on one’s karma. Now, I know that this is far from the truth. Sister Phil left our earth far too early. She had so much more love to give. I’ve got through the past few hours holding onto the hope that God is taking care of her in heaven. I don’t care whether you believe or don’t believe in a higher being, but I am desperately hoping that she’s being taken care of up there. That’s my only hope. Rest in Peace, Sister Phil.